So the rumours are true! 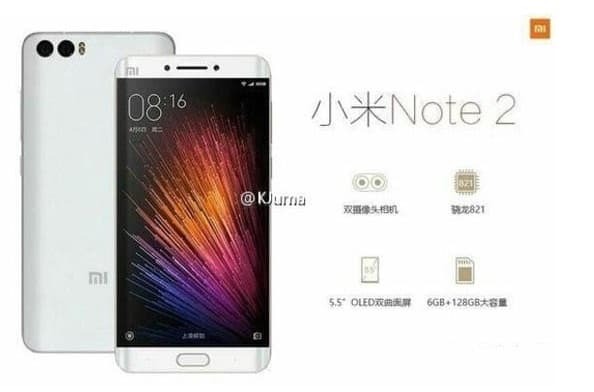 Xiaomi’s upcoming device, Mi Note 2 is expected to feature two-sided dual display. The Company, recently, confirmed it on its twitter handle and also released a teaser. 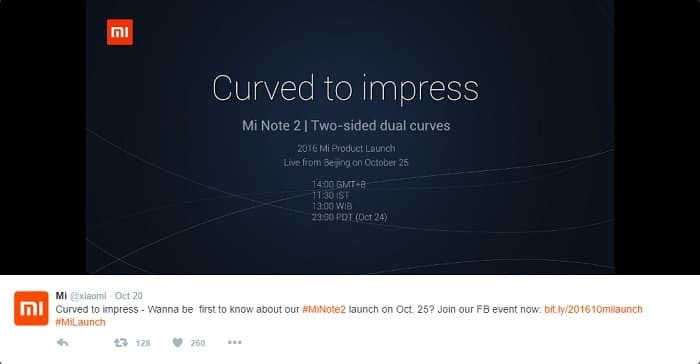 The teaser revealed that the phone will be unveiled on 25th of October at 11.30 AM IST and a live feed will be available on its Facebook page. The phone will be featuring an ultra-thin display with curves on both the sides. It is expected to have a 5.7 inch screen and a resolution of 1440 x 2560 pixels to provide fine picture quality and clear image display. Also rumoured to have the force touch feature, the device will be responding to force touch and other quick touch impulses. Super-Amoled coating will also play its part by providing a glare free display and protecting against scratch and dust. Coming to the processor, a quad core Snapdragon 821 chipset is expected to beat at its core. Coupled with Adreno 530 GPU, the phone will be able to manage high end applications and games. Expected to come in two variants namely – 4 GB RAM/ 64 GB internal memory and 6 GB RAM/ 128 GB internal memory, they might be available at a price of around $415 (Rs 28,000) and $445 (Rs 30,000) respectively. Also expected to feature an enhanced camera specification, the phone may feature a 23 MP Sony IMX318 rear camera sensor and a 12 MP front camera sensor respectively. Other sensors may include an iris scanner, finger print sensor, NFC, etc. Last but not the least, the phone will be powered by a 4100 mAh battery which will support quick charging abilities. As sweet as the specification sounds, the more is the layer of cloud which lies hiding the confirmation of all these feature. If the rumour becomes true, it will be clinching the top position in the smartphone market. However, the more likely the rumours are to be true, there are chances of everything to be false too! So keep your fingers crossed and wait for the truth to unfold on October 25th.